Never Far Away is the story of my older sister Estusia. Estusia was not only my sister and best friend. She is also my hero. But who she was and what she did have meaning for more than me, her sister. As a Jew, she is a hero for all Jews. As a woman, she is hero for all women. As a human being, she is a hero for all of us. Though she is known to history for her part and her fate, Estusia’s story has never been told. It is time. Estusia was one of four young Jewish women who were executed on January 5, 1945 as resistance fighters for their part in the October 1944 Sonderkommando uprising at Auschwitz. The other women were Ala Gertner, Roza Robota and Regina Safirztajn. 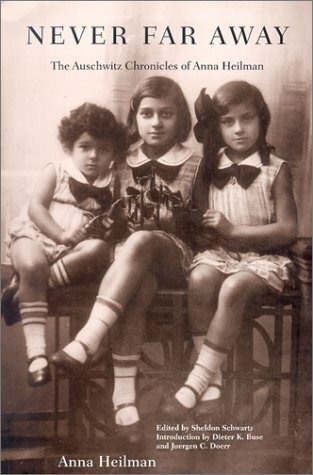 Ala, Regina and my sister worked as slave labourers in the “Union” munitions factory at Auschwtiz-Birkenau. I worked there too. As “essential workers” in the munitions factory we had among the best chance of survival. We had better rations and accommodations. It would have been easy to do nothing. Nevertheless we chose to fight back. My sister’s job was to measure gunpowder for the munitions. Her role in the plot was to steal a portion of the gunpowder she was supposed to be measuring. Hiding the gunpowder under our clothes, we smuggled it out of the factory past the S.S. guards. The S.S. conducted searches daily. Being caught meant immediate execution. The smuggled gunpowder was given to the fourth young woman, Roza Robota who then passed it on to the Sonderkommando. Before it was put down by the S.S., the Sonderkommando revolt succeeded in destroying Krematorium Number Four at Auschwitz. The destruction of the crematorium slowed down the killing machine at Auschwitz and saved many lives. Four hundred Jewish and non-Jewish prisoners died in the revolt and its aftermath. After months of interrogation and unspeakable torture, the four girls were hanged as resistance fighters in front of the whole camp. The Nazis murdered millions. What makes these four women different? What made them different is that they fought back. They fought back at a time and in a place where millions of innocent human beings, children, women, and men were immediately murdered upon arrival. Those who were temporarily reprieved were still to be murdered, only more slowly. The Nazis designed everyday existence to destroy the will to live, let alone the will to resist. Yet these young Jewish women chose to fight back. Auschwitz was a place where individual and mass murder was a casual part of the daily routine. Yet Jakub Kozelczik, the Kapo responsible for carrying out their death sentences, tried to stall their execution by insisting on getting confirmation from the Nazi Supreme Court. He hoped that in the meantime, the Russians would reach the camp. The Russians did reach Auschwitz, but not in time. The four young women were executed less than two weeks before Auschwitz was brutally evacuated by the Nazis before the advancing Red Army. The book also tells about the relationship between Marta Bindiger, Estusia and me. We were very close. Estusia smuggled a note to Marta while awaiting her execution. It said, "I know what is in store for me, but I go readily to the gallows. I only ask that you take care of my sister Hanka, so that I may die easier”. Jakub brought Marta’s response to Estusia, “Estusia, I promise that I will never abandon Hanka”. Marta kept her promise. I was in shock and in a fog after my sister’s execution. Marta took care of me. Marta knew the camp would be evacuated. Marta managed to get decent shoes for her and for me. Shoes. Such ordinary things. If not for these shoes, we wouldn't have been able to walk. If we wouldn’t have been able to walk, we wouldn’t have lived. .
On January 18, the day of the evacuation, I did not want to move, I didn't care. Marta saved my life. Marta moved me, bodily. And thus we started the death march. We walked and we walked. I remember being struck by the beauty of the scenery, the tranquility, the serenity, the peace. It must have snowed the day or the night before. The earth was covered with a pristine blanket of snow. All we could hear was the sound of hundreds of shuffling feet. As we walked, from time to time we could see a lonely figure sitting at the side of the road…someone who couldn’t walk any more. We passed by. We didn't dare to look back. An elderly Wehrmacht soldier guarded us. He probably was no longer fit for active military duty. He could hardly walk. I remember supporting him. There were so few guards and so many of us that we could have easily escaped. Some did. Marta and I plugged on. Should we escape? Where would we go? We had no idea where we were and we knew well enough that we would not be welcomed by the local farmers. Night fell, bright, clear and cold. Thousands of stars were lighting our way. It wasn't too dark. The white snow seemed to reflect whatever light there was. We stopped at night. We found shelter in a barn. It was warm. It smelled of wet straw and manure. When we left Auschwitz, each of us received a quarter of a piece of bread. Most of us had finished our bread long ago. So we helped ourselves to the cows' turnips. We eventually reached Ravensbrück concentration camp in Germany. We stayed there a day or two. We were taken by train to Neustadt-Glewe. In comparison to my transport from the Warsaw Ghetto to Majdanek, it was a royal trip. Although we were still in cattle cars, the doors were open. We were liberated on May 3, 1945, in Neustadt-Glewe. The Allies established a repatriation centre in a large building. Inside the building were rows of long tables. Each table had a name of a country on it. We were supposed to identify ourselves by our country of origin. Marta is from Slovakia. I am from Poland. We didn't want to be separated. While at the "Union" munition factory at Auschwitz, I sat next to a girl from Belgium. Her name was Roza Tabakman. Roza kept telling me about the wonderful food in Belgium, especially the ice cream. I persuaded Marta that ice cream was a priority. We registered for Belgium, giving Roza's name as our relative. I had boils on my lower body. I was taken to the local hospital, where they operated on me three times. After they wanted to operate on me one more time, I refused. Marta and I went to Belgium on a Red Cross plane. While in Belgium a Jewish organisation arranged for us displaced persons to go to a convalescent camp in Corbion in the Ardennes. It was beautiful. We were in the middle of a wood, surrounded by trees, luscious brush underfoot. It was serene, the quiet broken only by the chirping birds. There were three meals a day. It was wonderful, we told Roza, who we found in the camp. Despite the ice cream, I didn’t feel like celebrating. It was only five months after the execution. I filled my days writing a journal. I wrote up to the execution. I couldn't go on. Meanwhile, Marta met her true love in Corbion and married Alex. I went to Palestine. I was rejoined with my oldest sister Sabina and her husband Mietek, who survived the war in Siberia. After many trials and tribulations they managed to get to Palestine in 1942. I met all of our extended family who had lived in Palestine since before the end of World War I. In short order I managed to graduate from high school, get married, go back to school, graduate with a degree in Social Work, have two daughters and work full time. We emigrated to the U.S. in 1958, and to Ottawa, Canada in 1960, where we’ve lived ever since. I carried my journal with me, the whole time, but never looked at it again. In 1987 Marta came to visit me in Ottawa. Marta had read a great deal about the Holocaust. She gave an exhausting testimony to her friend and noted historian Eric Kulka. Kulka is author of many articles and the book" The Death Factory". Marta had read an article in a French newspaper mentioning the smuggling of the gunpowder and the revolt in Krematorium IV, naming only Rosa Robota. Marta also read Israel Gutman's book, "Men and Ashes". She found his description vague and lacking in details. Marta's mission was to see justice done, and to have all four girls take their place in history. I became active. In June, 1991 a monument honouring the four Heroines of Auschwitz, was erected at Yad Vashem, Jerusalem. In 1993, I took part in the Eli Rubenstein’s “Anguish to Hope” mission to Poland. I participated in the March of the Living in March and October 1994. The Auschwitz National Museum dedicated a plaque honouring the four Jewish heroines on the outside wall of block 27 in Auschwitz Block 27 is dedicated to Jewish Martyrdom and Heroism. In 1994 my sister was posthumously honoured by the Polish Government with the Cross of Auschwitz award. A ceremony to commemorate this event was held at the Polish embassy in 1996. In 1996 my sister was posthumously awarded the “Medal of Resistance" by the U.S. Holocaust Museum in Washington. The Museum has an exhibit on Jewish Resistance at Auschwitz. My sister’s name, together with those of Ala Gertner and Regina Saferstajn now joins that of Roza Robota. They died together for their heroism. It is fitting that they be remembered together for their heroism. And tonight, in 2001 we are launching this book. This book really got its start in July 1945 among the beautiful hills of the Ardennes in Belgium. Through the tireless, time consuming efforts and exceptional skills of Sheldon Schwartz, this diary became a book in its present form 56 years later . After the Yad Vashem ceremony, Sheldon Schwartz, my daughter Noa’s husband, asked me about the poor, neglected journal written in Polish, and stuck cozily in one of my drawers. It occurred to me that no one in my family, other than my husband, could read or understand Polish. At Sheldon's urging, I translated the journal into English . Sheldon became very enthusiastic about the journal and felt that it was of historical importance. He thought that it should be published, so that this story would not be lost and forgotten. But he thought that it had to have a beginning and an end. Sheldon spent years editing it and looking for a publisher. If it weren't for Sheldon this book would not exist. If not for Marta, I would not exist. Thus I dedicate this book to Marta who saved my life and to Sheldon without whom this book would not have been born. This page was last updated March 23, 2018. ©2001, 2004, 2005, 2015, 2018 All Rights Reserved.